Yeah, I've tried all of the above. Started from scratch, delete image, appdata folder, etc. different browsers. Always an issue for me. Does it have to do with the startup wizard? Because at the end it says we'll log you out and remove the admin user and then when you try to login, neither the admin creds, or user creds just created work. I am not able to reproduce this and have never experienced it. I tried both the stable and master branch. It does not remove the admin user you create, but the default password free administrator account that let's you access the webui after the first start. Do you have any adblocker or antivirus running that might interfere? Also might be good to post your docker run command. Also be sure to delete the appdata folder with rm -rf as it doesn't get deleted when removing a container in the webgui. 2. 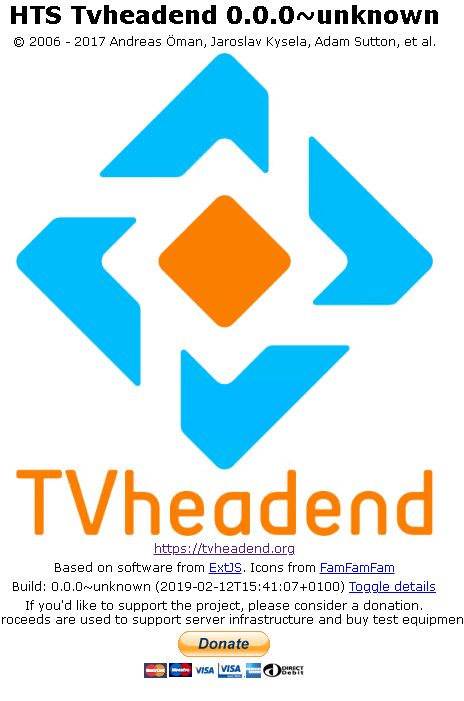 Deleted appdata tvheadend folder. 7. Open google incognito instance. - Running uBlock Origin on chrome as an adblocker, but have since tried on internet explorer with same error. Try not using 0.0.0.0 - Leave that blank or put your actual IP range in 192.168.1.0/24 for example. Can't locate LWP/UserAgent/Determined.pm in @INC (you may need to install the LWP::UserAgent::Determined module) (@INC contains: /usr/local/lib/perl5/site_perl /usr/local/share/perl5/site_perl /usr/lib/perl5/vendor_perl /usr/share/perl5/vendor_perl /usr/lib/perl5/core_perl /usr/share/perl5/core_perl) at /usr/bin/tv_grab_zz_sdjson_sqlite line 4927. BEGIN failed--compilation aborted at /usr/bin/tv_grab_zz_sdjson_sqlite line 4927. Using the newest update from the weekend (4.2.7-34~g036b9cbab). Yes it's missing the perl module. I'll add it when I get some time. Not sure when though. tv_grab_zz_sdjson_sqlite is still failing and can be fixed by including perl-lwp-useragent-determined in the build. I've submitted pull request #117 to solve this issue. I'm on "linuxserver/tvheadend:release-4.2" and the last time the docker updated was last night. me too. have seen it over the last 2 updates. everything seems to work as usual, but the release number is off. Yes it seems to be working fine but obviously not reporting a version number anymore. tv_grab_zz_sdjson_sqlite is still failing and can be fixed by including perl-lwp-useragent-determined in the build. I've submitted pull request #109 to solve this issue. Sorry, have completely forgotten to add the package. Haven't really had any time for lsio stuff either this year as work and normal life takes priority. Thanks for the pr. Will merge it when I figure out our new build system. This is due to our new build system. I'll check if we can get it fixed. I don't now why but after last update it takes about 5-20 minutes to log in and everything is slow. I must have done something wrong. But I fix it, delete and reinstall but takes one day to scan iptv channels again. How do I get EPG to work. Searching in three days now but the info I get is not a step to step. I grab my epg from: epg.SOME-SITE.com/epg/epg.xml.gz. Can't get TVheadend to reed it. The last update fixed the Picons, thx. Hm, some ting is wrong with the latest update. And on my machine. First I lost the connection to TvHeadOn when sanning channels then after some our Unraid crash and must do a cold reboot. Impossible to say what causes this with the info you have given. If you are using the latest tag, try the release-4.2 tag as that is the stable one. Latest is the development branch and will cause problems. I'm getting an error with this docker: mpegts: too much queued table input data (over 2MB) - tvheadend becomes unresponsive & I need to stop & start the docker to get it going again. A google search throws up a number of references on the tvheadend.org website but it's been down for the last 36 hours or so. Anyone know how to get in touch with tvheadend to let them know there's an issue with their website? I would like to pass my SAT>IP Server to the TVHEADEND docker. unRAID DVB is showing no DVB Adapter Driver, is this the reason, why I don't see any TV Adapter in TVHeadend docker? Do I need unRAID DVB at all? Any great ideas how to use my sat>ip server with TVHeadend? Thank you very much. no need for DVB Edition for Sat IP Tuners, i use an DD Net V2 and a Fritz 6490 as Sat IP source, what Sat IP Server do you have ? It is a Selfsat antenna which has the Satip server imbedded. Question is how to pass through the satip ip address. I was running tvheadend always in host mode and I have removed the DVB Edition. How do I remove the -p flag? If you use IPTV, SAT>IP or HDHomeRun, you need to create the container with --net=host and remove the -p flags. This is because of a limitation in docker and multicast. The docker is pulling the wrong IP address. 192.168.178.28 is the server address, the sat>ip address is 192.168.178.30. Adding --satip_binaddr into Extra Parameters is causing a docker crash. You don't need to remove the port mappings as unraid is smart enough to remove it when host is enabled. What you see in the log is tvheadend starting up it's satip server. It's not the selfsat server. You are using the wrong option. 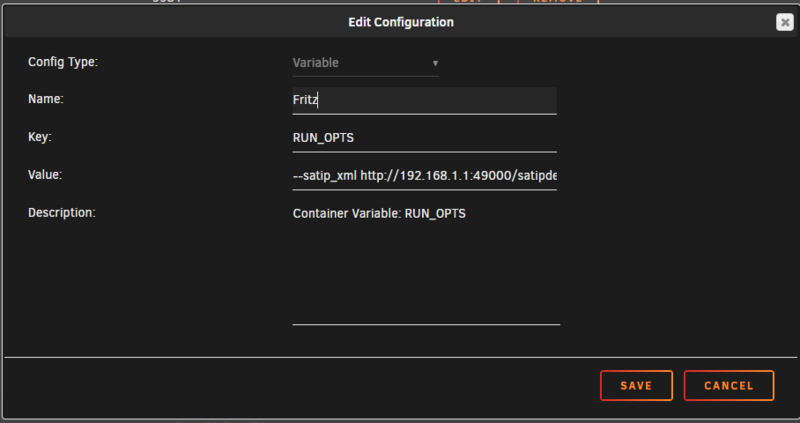 To set the satip server address you use the --satip_xml switch. There you supply the address to selfsats xml. Thanks @saarg the message appears when I am adding --satip_xml 192.168.178.30 which is the selfsat ip address. I didn't read well enough your earlier posts. It's not going in the extra parameters field, it's an env variable. Check the Readme on github in the first post for the info. Did you try to push the discover satip servers in the satip server tab of tvheadend?